October 8th 2018, Banff Alberta. 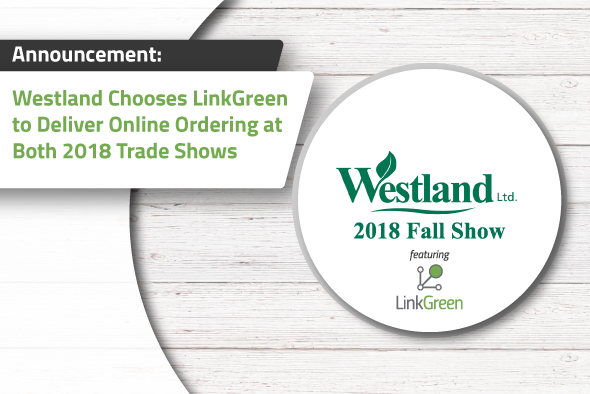 LinkGreen is pleased to announce that Westland Ltd, Canada’s largest, national distributor focused exclusively on the Lawn and Garden industry, has chosen LinkGreen to deliver online ordering to both of their 2018 trade shows. This partnership provides an efficient and interactive ordering experience for the attendees of the Alberta and Ontario trade shows, further demonstrating why Westland Ltd is considered an industry leader in customer service. Through this partnership, LinkGreen will be equipping over seventy wholesale vendors with online ordering, allowing sales reps to place customer orders directly through LinkGreen’s mobile sales rep app. Through the same technology, event attendees can also enjoy the convenience of accessing their specific pricing and placing orders independently, all from their mobile device. Westland Ltd. a customer-centric organization, understands the value of modernizing their trade show. By offering a solution to streamline ordering and administration for both the vendors and the customers, the result is a far superior experience at the event and beyond. “LinkGreen has offered us an effective solution for all phases of our sales cycle – Show, Booking and In season. Our trade shows are critical however, as we typically write upwards of 40% of our annual volume in the 3 days of our Show. LinkGreen’s solution ensures those orders are accurate, secure and in our system quickly, leaving the customer and the vendor with the order detail they require after the shows are over.” Nancy Spence, CFO Westland Ltd.
“Working with Westland Ltd. demonstrates how LinkGreen’s technology can be beneficial to all levels of the supply chain by bringing a common technology to all vendors, distributors and customers for their trade shows. Mobile ordering technology takes paper order forms out of the equation, reducing administration time and order entry errors.” Commented Warren Patterson CEO of LinkGreen. By offering their customers the same online ordering at the trade show and all year round through LinkGreen, Westland Ltd.is leading the way in customer service and remains 100% committed to the independent garden centre and promoting lawn and garden goods to the Canadian consumer.